Recovery after mesothelioma surgery depends on the procedure and the patient, but it usually takes four to eight weeks or as long as one year. The path to recovery after surgery often is long and challenging. Recovery can be especially difficult for patients recuperating from aggressive, tumor-removing surgeries such as an extrapleural pneumonectomy (EPP) and pleurectomy and decortication (P/D). Mesothelioma treatment is a life-changing venture that could improve the length and quality of your life, giving you more time to spend with the people you love. But these benefits come with many risks and hardships — physical and emotional. While experts consider tumor-removing surgery essential for long-term survival, not every patient qualifies. For those who do, the recovery period can range from one month to a year, depending on the procedure. Chemotherapy and radiation therapy can cause fatigue and other undesirable side effects, but otherwise might not interfere with your daily life. A treatment plan combining surgery and one or more additional therapies is the current gold standard, but this approach may delay recovery. Before you make treatment decisions based on your doctor’s advice, it’s important to familiarize yourself with each treatment option and the recovery phase that lies ahead. For most tumor-removing surgeries, a hospital stay of at least two weeks is common. Recovery at home usually is less intensive — but lasts much longer — from eight weeks to as long as a year. Any complications along the way can delay recovery. Every patient and treatment plan is unique, so no recovery timeline will be exactly alike. The time it takes to recover fully can vary depending on the stage of your cancer, your overall health and the specific course of treatment. Day 1: After the procedure, you will wake up with many tubes in place. Some deliver painkillers and hydrating fluids to your body, while others drain your wound, stomach fluid and waste. You may need to wear an oxygen mask to help with breathing. Pain or discomfort is common after surgery, so your doctors and nurses will work with you to develop an effective pain management plan. First Week: Pleural mesothelioma patients can typically start eating and drinking again the day after surgery. Peritoneal mesothelioma patients may have to wait longer to give the bowels more time to recover. When you can eat and drink on your own, a nurse will remove your IV hydration catheter. As early as day two, your care team will guide you through deep breathing and gentle leg exercises. After a few days, you’ll be standing up and walking short distances. You won’t be able bathe or shower until your incisions are fully healed. Week 2: If recovery is going well, most patients can return home after one or two weeks in the hospital. You will have to avoid most physical activities for several weeks. After about two weeks — sometimes sooner — you’ll return to the hospital to have your stitches or staples removed. Your drainage tubes will stay in place as long as they continue to drain fluid, which usually lasts longer than one week. Week 3: You may feel more tired than usual and need to rest often, but be sure to maintain a gentle exercise program and continue your breathing exercises. Your care team will provide exercise guidelines and answer any questions about home care. If you experience any new pain, talk to your doctor about what is causing it. Week 4 Through Week 8: It could take between six and eight weeks before your normal energy levels return. You should get a little stronger each day, but avoid overly strenuous activities. You shouldn’t lift anything heavier than 10 pounds for six to eight weeks after open surgery, or about two weeks after minimally invasive diagnostic surgery. You may be healthy enough to go back to work four to six weeks after surgery, but always check with your doctor first. Sometimes it can take months before patients start feeling normal. Be sure to get plenty of rest, and don’t rush your recovery. 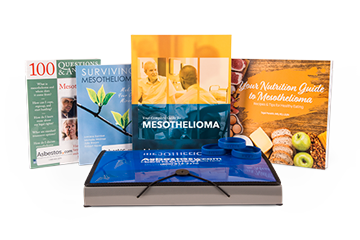 Information about mesothelioma, surgery, wristbands & more for patients and caregivers. Tumor-removing surgery is significantly more invasive than diagnostic surgery. The goal is to remove as much of the cancer as possible. These surgeries take hours to complete and require a hospital stay of approximately two weeks, sometimes longer. Recovery at home depends on the extent of the surgery and may take two months to a year. EPP is considered the most aggressive surgery for pleural mesothelioma. It removes the cancerous lung, the diaphragm, nearby lymph nodes and the lining of the heart and lung. EPP patients usually stay in the hospital for two weeks. Full recovery from the aggressive EPP procedure usually takes six to eight weeks, but may extend to three to four months. This procedure is considered less aggressive than EPP. It removes the lung lining and any parts of the lung, diaphragm, chest wall and heart lining that appear cancerous. Patients who received a P/D should expect a hospital stay of about one week. Recovery from the lung-sparing P/D procedure ranges from four to six weeks. Peritoneal mesothelioma patients often benefit from cytoreductive surgery and heated intraperitoneal chemotherapy (HIPEC). The surgical part of this procedure aims to remove as much cancerous tissue as possible from the abdomen. It removes the lining of the abdomen and parts of organs that appear cancerous such as the stomach, intestines, liver, spleen and pancreas. Patients can expect a hospital stay of at least two weeks. Recovery from cytoreductive surgery and HIPEC depends on the extent of surgery and ranges from six weeks to a year, but it can add years to life expectancy. Surgery is also used to diagnose mesothelioma. Diagnostic surgeries are less invasive than surgeries that remove tumors. It takes less time to recover from diagnostic surgery than tumor-removing surgery. Diagnostic surgeries are minimally invasive and recovery usually takes a few days to a week. These surgeries involve just a small incision to give doctors access to the chest cavity or abdominal cavity. Doctors insert a small tube through the incision to collect tissue or fluid samples, also called biopsies. These samples are tested for signs of cancer. There are two primary surgical procedures used to diagnose pleural mesothelioma. This procedure drains excess pleural fluid from around the lungs and some of the fluid is sent off for diagnostic testing. Recovery depends on how much fluid needs to be drained. A chest tube is used to drain the fluid and the tube will stay in place until a sufficient amount of fluid is drained, which may take a day or two. Patients stay in the hospital until the chest tube is removed and may need to stay a little longer to ensure no complications occur and that no infections develop. At home, patients will need to keep the incision site clean and avoid moderate or strenuous activity for several days. Also known as video-assisted thoracic surgery (VATS), this procedure gives doctors an inside look around the chest cavity. Doctors can drain excess pleural fluid with a chest tube and collect tissue samples for testing. Patients remain in the hospital until the excess fluid is fully drained, which may take several days. When patients leave the hospital they will need to keep the incision site clean, limit activity and avoid driving while on pain medication. Recovery at home takes about one week. This procedure drains excess peritoneal fluid from the abdomen and a sample of the fluid is collected to test for signs of cancer. Once a sufficient amount of fluid is drained, patients stay at the hospital for several hours or may need to stay overnight to watch for complications and signs of infection. At home, patients will clean the incision site to prevent infection. Patients also need to limit activity for 24 hours. This surgery gives doctors an inside look around the abdomen and allows them to collect tissue samples for cancer testing. Some patients go home the same day of surgery, while others may stay overnight for monitoring. Pain around the incision site and around the abdomen is normal and may last for several days. Your doctor can prescribe medication to ease the pain. During the procedure, carbon dioxide gas is used to inflate the abdomen, which can lead to bloating and irritation of the diaphragm. Shoulder pain is common because the diaphragm shares nerves with the shoulder. Bloating, shoulder pain and general discomfort should go away within a few days. Full recovery takes about a week and patients should limit activity during that time. If you’re healthy enough for mesothelioma surgery, there’s a good chance your doctor will recommend additional treatments before, during or after the procedure. This approach, known as multimodal therapy, currently offers the best hope for long-term survival. It is important to understand a combined approach to treatment can affect your recovery time. A multimodal therapy plan that incorporates surgery typically lengthens recovery time, but all patients respond to treatment differently. Multimodal therapy can include any combination of surgery, chemotherapy and radiation therapy as well as experimental treatments such as immunotherapy. The length of your recovery will vary depending on the treatments you choose and how your body reacts to them. Side effects can be difficult to manage, so ask your doctor about what to expect and how you can cope. Most patients feel weak or drained after chemotherapy, but the tiredness generally subsides after a few days. Once it passes, you may feel even better than before. Medication can help with post-treatment nausea and vomiting. There are no treatments to help with hair loss, but your hair will grow back after your last cycle of chemotherapy. We'll help you or a loved one find the most qualified mesothelioma specialists and treatment center facilities in your area. Most chemotherapy is done on an outpatient basis and takes a few hours to complete. Heated chemotherapy requires a hospital stay of a week or more. Certain side effects may last for weeks or months after your last chemotherapy cycle. For example, peripheral neuropathy, which is a type of nerve pain in the extremities, may develop during or after treatment. The symptoms of peripheral neuropathy may peak three to five months after your last cycle. Pain medication and complementary therapies are available to help people through recovery. Chemotherapy can also lead to thinking and memory problems commonly called chemo brain. This is a common side effect reported by many cancer patients, including mesothelioma survivors undergoing chemotherapy. However, chemo brain isn’t only caused by chemotherapy. Common signs of chemo brain such as forgetfulness, trouble multitasking and feeling mentally “slower” than usual may occur before, during or after cancer treatment. Chemo brain symptoms typically only last a short time — fading as chemotherapy ends — but can go on for years. Some patients experience cognitive dysfunction long after treatment is over, and there are cases where patients never fully regain mental ability. Like chemotherapy, radiation therapy is an ongoing treatment that can drain your energy and cause fatigue. If you opt for radiation therapy, the most common side effects include fatigue and redness, irritation and hair loss around the treatment area. Having chemotherapy before or at the same time as radiation therapy can make the skin reaction worse. Radiation therapy for mesothelioma typically lasts four to five weeks, with five 30- to 60-minute sessions each week. Fatigue tends to increase as treatment progresses and then improves after therapy ends. Make sure to get plenty of rest. Talk to your doctor about the best way to care for skin irritation. Your doctor may recommend that you avoid applying soap, lotion, perfume and cosmetics to the treatment area. You will need to schedule regular follow-up appointments with your doctor once treatment ends. It’s difficult for the body to recover from mesothelioma treatment, particularly when surgery is part of your treatment plan. Regardless of the treatments you receive, there likely will be emotional hurdles to overcome as well. The days following chemotherapy and radiation therapy may feel exhausting, but as long as you have the energy, you should be able to perform normal daily activities. You need to be more careful with physical activity after major surgery because the recovery process is much longer. A good balance of gentle exercise and rest can help alleviate fatigue from treatment. If you feel pain during any type of activity, stop immediately. You may want to consider meeting with a physical therapist to help regain strength. While you work on your physical recovery, don’t neglect your emotional needs. Cancer treatment is never easy, and it’s perfectly normal to feel a wide range of difficult emotions, including sadness, anxiousness and fear. Studies show many cancer patients can achieve a higher quality of life by joining a support group and sharing their feelings and experiences with others. If support groups aren’t for you, there are plenty of other outlets that might fit your situation and personality better. You can also seek emotional support from family, friends, spiritual groups or one-on-one counseling. Surviving cancer may be one of the greatest challenges you’ll ever face, but you don’t have to face it alone. It’s not easy to stay upbeat throughout treatment, but a positive attitude and a solid support system can help tremendously on the road to recovery. Thoracic Surgery Associates. (n.d.). Thoracoscopy. Fairview Health. (n.d.). Discharge instructions for paracentesis. Giorgi, A. (2017, September 6). Laparoscopy. Cooper, M. (2017, January 31). Lung surgery - discharge. Tsilimparis, N. et al. (2013, January). Quality of life in patients after cytoreductive surgery and hyperthermic intraperitoneal chemotherapy: Is it worth the risk? Annals of Surgical Oncology. American Cancer Society. (2014, April 14). Working during cancer treatment. American Cancer Society. (2013, December 19). Lifestyle changes after malignant mesothelioma. American Cancer Society. (2016, February 17). How might having malignant mesothelioma affect your emotional health? Cancer Research UK. (2015, December 8). Surgery. Cancer Research UK. (2016, July 5). After surgery.